Setting an entirely new standard for dry dog foods. 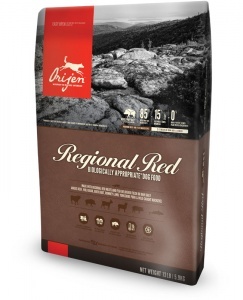 Orijen Regional Red replicates the same diverse balance of fresh meats, fruits vegetables and grasses that dogs would encounter in their natural environment. All dogs are evolved as carnivores possessing a biological need for a diet rich and varied in fresh whole meats supplemented with smaller amounts of fruits vegetables and grasses. That’s why Biologically Appropriate ORIJEN Regional Red features ranch-raised Black Angus beef, wild boar, lamb, heritage pork and bison - all ranched within our region and delivered FRESH EACH DAY so they’re brimming with goodness to nourish completely. Prepared from Canada’s best and freshest ingredients in our award-winning kitchens, ORIJEN keeps your dog happy healthy and strong - read our ingredients and we think you'll agree! 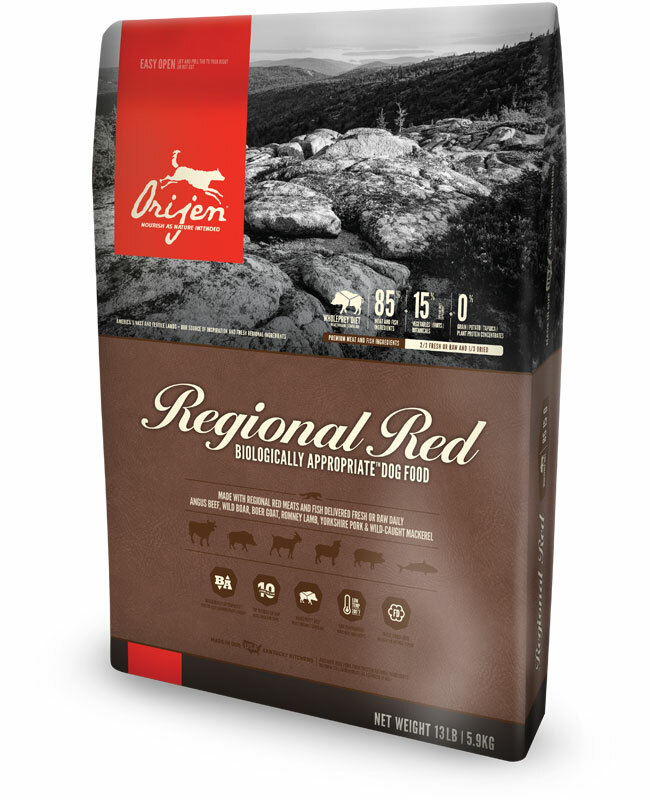 Brimming with goodness to nourish completely, ORIJEN Regional Red features unmatched inclusions of Black Angus beef, wild boar, lamb, heritage pork and bison - all ranch-raised on local ranches and farms, passed fit for human consumption and then delivered fresh each day. Fresh deboned Angus beef (6%); fresh deboned wild boar (5%); fresh deboned lamb (5%); fresh beef liver (5%); fresh deboned pork (5%); fresh pork liver (5%); fresh whole herring (5%); fresh lamb liver (5%); dehydrated beef (4%); dehydrated lamb (4%); dehydrated herring (4%); dehydrated salmon (4%); dehydrated Pollock (4%); beef tripe (3%); fresh deboned bison (3%); lamb fat (3%); whole egg (3%); red lentils; chickpeas; green peas; yellow peas; green lentils; herring oil (2%); pea fibre; yams; sun-cured alfalfa; pumpkin; butternut squash; spinach greens; carrots; Red Delicious apples; Bartlett pears; cranberries; blueberries; kelp; liquorice root; angelica root; fenugreek; marigold flowers; sweet fennel; peppermint leaf; chamomile; dandelion; summer savory; rosemary; Enterococcus faecium. ME (calculated metabolisable energy) 3980 kcal/kg (468 kcal per 250ml cup) (120g). Calories distributed to support peak physical conditioning with 39% from protein; 19% from fruits and vegetables; and 42% from fat.